Add customizable NPCs to Minecraft! NPCWarehouse is an NPC plugin designed for RolePlaying servers (Can be used on Creative and SMP servers as well, but not focused on this). NPCWarehouse will link in with other role playing plugins (ex. Factions, PermissionsEx, mcMMO, Spout/Spoutcraft) for a great npc experience. A list of NPC features is below. Currently this plugin is run and coded by jeremytrains, but if you would like to help or contribute, just post below! Help is always appreciated (If you decide to help, I will send you the source code). Customize the NPC's name, messages, armor, items, and more! Mailmen allow you to connect two NPCs on either the same server or different servers, and send messages between the two of them. Players read their mail by going to the MailMan NPC and reading their inbox, just like a regular mailman. Note: By enabling mailmen, you agree to send information (NPC IDs, NPC names, your IP and Port, and any mail messages sent) to NPCWarehouse.net in order to transfer the messages between servers. The new Bukkit safeguard is described in detail here. NPCWarehouse does use Minecraft/CraftBukkit code outside of the API. This means that the safeguard does affect NPCWarehouse. 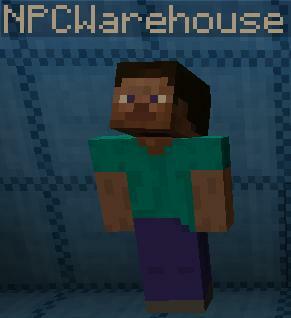 You will need to have a new version of NPCWarehouse for every new version of Minecraft. I will do my best to get a compatible version released ASAP after an update, and add new features after a version is compatible. Don't know what version of the plugin your jar file is? You can use the NPCWarehouse version check by going to http://ci.npcwarehouse.net/fingerprintCheck, uploading your file, and it will tell you which build number the jar file is from. The version check will work with all recommended versions of the plugin (downloaded here) after v0.9.3, but it will work with any version downloaded from the Jenkins server. Can you pls. check this error? CI Server appears to be down. Can you please make a pathfinding thing like citizens. where you can set a path for the npc and it will walk it. Like so set a waypoint one end of town, then walk to other end of town and set waypoint, so the npc will walk up and down the town. Citizens has it, but citizens doesnt work with MCPC plus (modpack server), and your plugin does. If you had this your plugin would pretty much replace citizens completely. Oh and if you do add it could you make it so the npc can look at you as it walks past and if within range it talks, so it walks past player and says hi, and keeps walking. Something like this would be perfect for the rpg town im making on the server. Evey time I do the /npc create command it gives me the *an internal error occured when attempting to perform this command. How can I create a NPC that fights whichever player who is close to them? And won't fight when the player is at a distance away from them? Thanks! Can someone tell me if this works server side or client side? I have been fooling around with this plugin for a day or 2 now and i have 3 questions. 1) I made the guard and made him aggro but he wont attack mobs. 2) When i di /lookat or /move it says the comand worked but it really didnt. 3) How do i enable the trader? Btw im not very tech savy. Hello again, i cannot figure out how to turn off the following command, once it has followed someone, it will not stop. Thanks. Should I think about an alternative? This is an error with MCPC. I will try to find the problem as soon as I can. "/[npc type] toggle" while selecting an npc. For example, /guardian toggle. Vault is only required if you want permissions or economy support. If you want to use GroupManager with NPCWarehouse, you need Vault. If you aren't using permissions or economy with NPCWarehouse, then you don't need Vault. What is the output of /npcdebug? Hey Jeremytrains, commented here before. How do i create a certain type of NPC like a guard, does this have to be done through a permission plugin? Also, even if i do not want to add permissions to who can use this plugin, do i still have to have Vault installed, or is GroupManager okay? Cheers. Hey there, awesome addon, hope to be able to use it soon. I seem to be having the same problem Akarshi is having, when I go to create an npc none appear and I get an error in console.